Brian Fuller St. Pierre (born November 28, 1979) is a former American football quarterback who is currently the head football coach of St. John's Preparatory School in Danvers, Massachusetts. He was originally drafted by the Pittsburgh Steelers in the fifth round of the 2003 NFL Draft. He played college football at Boston College. St. Pierre was born in Salem, Massachusetts and attended St. John's Preparatory School in Massachusetts. He broke the school's single season and career records for completions, attempts, touchdown passes, touchdown rushes, completion percentage and games played. He earned All-America honors from Tom Lemming, PrepStar and SuperPrep magazines. He was also named Massachusetts and New England Gatorade Player of the Year and was selected as USA Today's Massachusetts co-player of the year. He was team captain for the 1997 St. John's team that finished 11-0 and won the state and New England championships. He was a three-year Catholic Conference all-star in football and a two-time Catholic Conference all-star in baseball. He was also a member of the St. John's basketball team that won the 1997-98 Catholic Conference title. After spending the 1998 season as a red-shirt, St. Pierre entered the 1999 season as the Boston College Eagles second string quarterback behind junior Tim Hasselbeck. He made the first start of his career on October 16 against Pittsburgh. He completed nine of fiftten passes for 115 yards and threw the first touchdown pass of his career. He also ran the ball seven times for 62 yards before leaving the game with a concussion. Due to an injury to Hasselbeck, St. Pierre was the starting quarterback in BC's 2000 season opener against Notre Dame. He completed 15 of 29 passes for a 172 yards and two touchdowns in a 28–16 loss to the Fighting Irish. St. Pierre spent the remainder of the season as a backup, however coach Tom O'Brien used him for at least one possession of every game. St. Pierre became the Eagles' starting quarterback in 2001 and started all 12 of Boston College's games. He completed 149 of 279 passes for 2,233 yards, 25 touchdowns, and 10 interceptions. He was the co-winner of the 2001 Scanlan Award, an award given by the Boston College Varsity Club Award to the senior football player outstanding in scholarship, leadership, and athletic ability. BC finished the year with a 7–4 record and defeated Georgia 20-16 in the Music City Bowl. During the 2002 regular season, he completed 237 of 407 passes for 2,983 yards, 18 touchdowns, and 17 interceptions. St. Pierre went 25-of-35 for 342 yards, three touchdowns and no interceptions in the final game of his collegiate career, a 51-26 win over Toledo in the 2002 Motor City Bowl. St. Pierre finished his college career third on the all-time Boston College passing list with 5,837 yards and third on the all-time touchdowns list with 48 career TDs. St. Pierre was drafted by the Pittsburgh Steelers in the 5th round of the 2003 NFL Draft. He spent his rookie season as the Steelers' third string quarterback  behind Tommy Maddox and Charlie Batch. In 2004, St. Pierre made his first appearance in a regular season game. He came in and ran for a key first-down conversion late in the fourth quarter on a two-yard naked bootleg in the season finale against the Buffalo Bills. He finished the game 0/1 passing and he had 5 carries (4 of which were kneel-downs) for -3 yards. 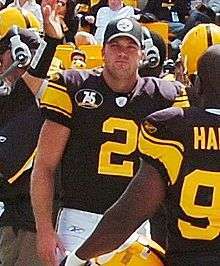 St. Pierre was allegedly one of the Pittsburgh players impersonated by a con man, Brian Jackson in 2005, along with Jerame Tuman and Ben Roethlisberger. On September 3, 2005 he was waived by the Steelers. On September 22, 2005, the Ravens signed St. Pierre to their practice squad, activating him on December 8. The Ravens released him as part of their mandatory cuts on September 2, 2006. He never appeared in a game for the Ravens. On September 4, 2006, St. Pierre was signed to the Steelers' practice squad. Two days later he was moved to the 53-man roster because starter Ben Roethlisberger would miss time following an appendectomy. He was cut by the Steelers on October 14 and re-signed by the team two days later. He was cut again by the Steelers on November 11 and re-signed with Pittsburgh two days later. On March 27, 2008, St. Pierre signed a one-year contract with the Arizona Cardinals, where he played for former Steelers offensive coordinator and current Tennessee Titans head coach Ken Whisenhunt. He was the Cardinals third quarterback for all 16 regular season games and all four postseason contests, including Super Bowl XLIII. St. Pierre completed his first NFL pass on January 3, 2010 versus the Green Bay Packers. Two plays later, he threw his first interception to Tramon Williams. With three minutes left in the fourth quarter, St. Pierre threw his first career TD to Larry Fitzgerald. St. Pierre was released at the end of the 2009 season. On November 16, 2010 the Carolina Panthers moved St. Pierre to their active roster just five days after joining their practice squad on November 11. This was in light of rookie quarterback Jimmy Clausen being diagnosed with a concussion after a loss to the Tampa Bay Buccaneers the previous Sunday. On November 18, 2010 the Carolina Panthers declared St. Pierre the starting QB for their November 21 game against the Baltimore Ravens, despite the fact that he had only thrown 5 passes in his NFL career. In his first start he completed 13 of 28 passes for 173 yards, one touchdown and two interceptions. In 2014, St. Pierre became head football coach at his alma mater, St. John's Preparatory School in Danvers, Massachusetts. St. Pierre is also an administrator with the St. John's Office for Institutional Advancement. ↑ "A Steelers impersonator wreaks havoc on one woman's life - ESPN The Magazine". Sports.espn.go.com. 2011-04-04. Retrieved 2012-09-06. ↑ "Steelers activate St. Pierre - NFL - ESPN". Sports.espn.go.com. 2006-09-06. Retrieved 2012-09-06. ↑ "St. Pierre is cut again; CB is added to roster - Pittsburgh Post-Gazette". Post-gazette.com. 2006-10-15. Retrieved 2012-09-06. ↑ "Notebook: Steelers re-sign St. Pierre | TribLIVE". Pittsburghlive.com. 2006-10-17. Retrieved 2012-09-06. ↑ "Steelers sign Stanley, release QB St. Pierre - Pittsburgh Post-Gazette". Post-gazette.com. 2006-11-12. Retrieved 2012-09-06. ↑ "Pittsburgh Steelers 2012 Team Transactions - Trades, Injured List, Free Agents, and Signings - ESPN". Sports.espn.go.com. Retrieved 2012-09-06. ↑ Gulizia, Anthony (January 18, 2014). "Brian St. Pierre named head coach at St. John's Prep". Boston Globe. Retrieved March 18, 2014. Wikimedia Commons has media related to Brian St. Pierre.